Finding leads, contacting them, and turning them into customers is the goal of business. That’s no different than it’s ever been. What has changed is the process and the potential benefits, which are greater than ever. 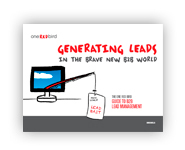 After reading this eBook you will be able to better define your lead management flow and how to identify and drive leads through to sales for conversion into revenue.